There is something magical about Dutchies that brings friends and family together. Stunning five bedroom three bathroom executive beach house with direct access to the white sands and pristine clear waters of secluded Dutchmans Bay. 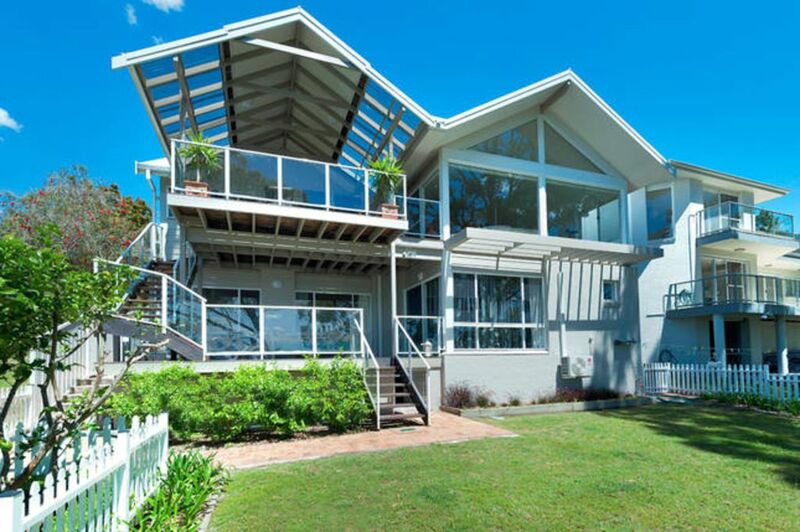 The Home has been architecturally designed to maximise this sought after exclusive waterfront location. Elevated above the bay it emphasises the indoor outdoor coastal holiday lifestyle yet maintaining full privacy and only steps away from sand beneath your toes. UPSTAIRS the large open plan living areas with cathedral ceilings and expansive use of glass offer an uncompromised sense of space, further emphasised through the adjoining covered entertaining deck. Engaging the northerly aspect the generously sized deck complete with Weber bbq and outdoor furniture make alfresco dining a pleasure throughout the seasons, or alternatively provide a perfect space to enjoy a morning coffee whilst indulging your senses with the magical sounds and views of the bay. An extensive dining room with Tasmanian Oak 10 seater dining room suite is adjacent to the kitchen complete with stone bench tops and stainless steel appliances, great for entertaining large groups of family and friends. The main living room features a 50 inch plasma TV complete with a surround sound home theatre system including iPod connectivity, FOXTEL and DVD player, whilst a second living/entertainment room has a 64 inch plasma TV screen,home theatre, DVD player, FOXTEL and PS-3 game console. The Upstairs level of the beach house also comprises of a large bedroom with queen timber bed, beautiful plantation shutters and wooden floors that continue out across the wide hallway to the main level bathroom with full shower suite. DOWNSTAIRS is home to the sizable master bedroom with King Bed and full ensuite. The room offers views through the extensive windows, glass sliding doors to a second entertaining deck welcome the bay indoors, creating that perfect escape to sprawl out with a book or watch a movie on the 42 inch plasma TV and enjoy the afternoon breeze. There is a second queen bedroom and a further two twin rooms, each looking out across the deck complete with daybed embracing the atmosphere the bay has to offer. There is another large family bathroom with double sinks, full shower suite and bathtub. A laundry with family sized washer and dryer and an outdoor shower to wash away the sand from the kids and the beach toys. Local restaurants and shops are an easy 10 minute walk away so you can enjoy a glass of wine with a meal and a peaceful stroll home to the beach house. Only minutes by car to local supermarkets and fresh produce - and if you like seafood be sure and make you way down to the seafood markets on the main Nelson Bay foreshore. And for those designated lazy days there is a collection of DVDs as well as a childrens book library and a suite of Xbox games to entertain kids both young and old. The home is perfect for a family holiday, extended family reunion or even a group of couples or friends wanting to escape the kids for a weekend. Spoil your friends and family and come and enjoy the beach house and this beautiful location for yourself! Beautiful spot and the house was very comfortable for a group of 9. Spacious and comfortably furnished. Terrific location. We had a very enjoyable weekend. The house was very spacious. Location was fabulous.We enjoyed the short stroll to the lovely beach. The town centre was within an easy walk. We would thoroughly recommend this house to our family & friends. Great holiday home with private access to the beach. Big spacious rooms with all facilities. Large tv screens foxtel, sound bars, board games, you name it and its there. The view was great although the trees have grown out to hide most of it. We went start of February so it was hot. A bit disappointed to find out 2 rooms had no access to central air con so it was hot and had to rely on the fan. Secondly there were bugs and cockroaches in the rooms, we spotted 2 on bed side. It does require extensive fumigation for guests to have a better experience. The neighbours are very strict about the 10pm rule. They dont even expect you to sit out int he balcony, even if you are chatting and not being loud. The house was perfect for our large group of family from around the world. We had a great time catching up over beers on the deck and the two living areas made private times possible. Three bathrooms was also perfect for such a large house. Beautiful property. Beautiful beach right at our back door. Easy to follow instructions. We would definitely stay again. Spacious beautiful house spread over levels to allow for privacy.Well equipped. Ten minutes easy walk into Nelson Bay a bonus. Great eateries in the area . Can't wait to go back.